A Chinese girl has been entertained by the Spanish royal family after success in the Spanish college entrance examination. 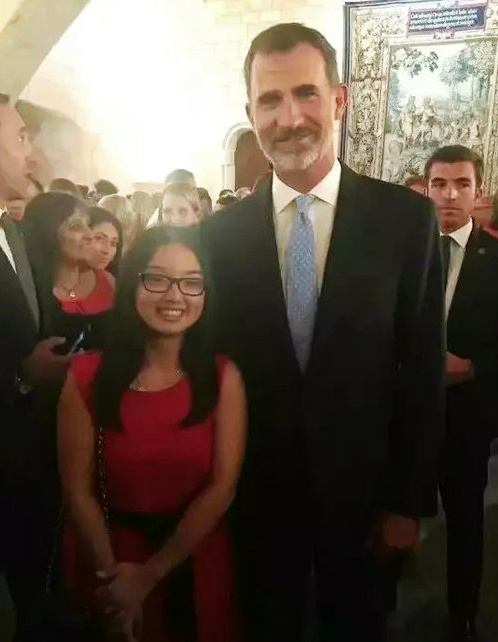 17-year-old Chen Yali and her mother were invited by the Spanish King Felipe VI and Queen Letitzia, to attend a summer banquet with local politicians, businessmen and cultural figures, at their summer residence, the Palacio de Marivent, on the Balrearic Island of Mallorca, on August 4, reports Spanish media. Born in the town of Manacor, Chen Yali lived in east China's Zhejiang province with her grandparents until she was 4 years old. She then lived in Spain for 13 years, becoming fluent in four languages, namely Chinese, English, Spanish and Catalan. Chen is regarded as a "super scholar" by her classmates and friends, becoming the Balearic Champion in the Spanish college entrance examination in 2017. Chen Yali said her dream was to become an expert in heart disease, and so she has chosen to specialize in medicine at the Autonomous University of Madrid. Spanish King Felipe VI is himself an alumnus of the university. Chen Yali has also won scholarships and certificates of merit granted by local Chinese associations.